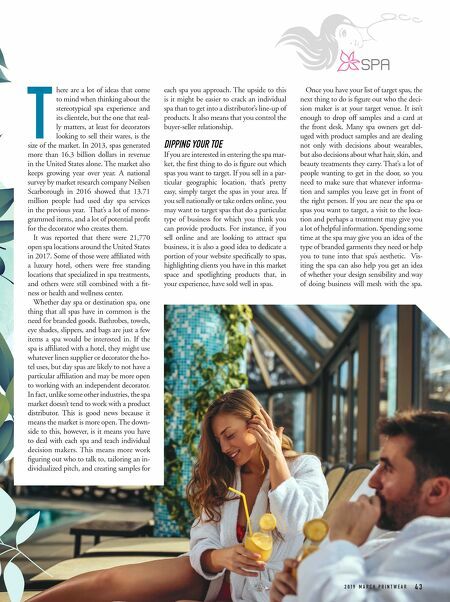 2 0 1 9 M A R C H P R I N T W E A R 4 3 T here are a lot of ideas that come to mind when thinking about the stereotypical spa experience and its clientele, but the one that real- ly matters, at least for decorators looking to sell their wares, is the size of the market. 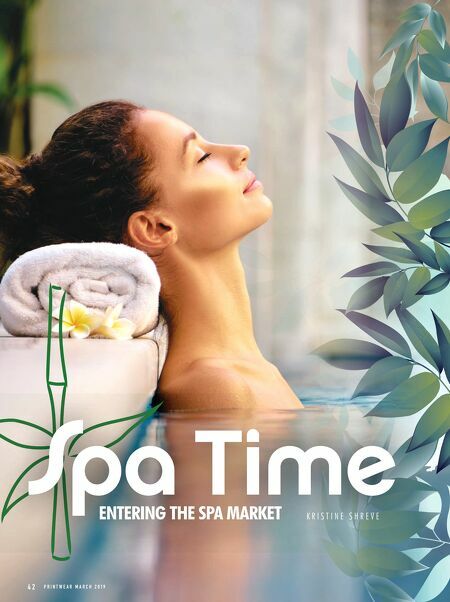 In 2013, spas generated more than 16.3 billion dollars in revenue in the United States alone. The market also keeps growing year over year. A national survey by market research company Neilsen Scarborough in 2016 showed that 13.71 million people had used day spa services in the previous year. That's a lot of mono- grammed items, and a lot of potential profit for the decorator who creates them. It was reported that there were 21,770 open spa locations around the United States in 2017. Some of those were affiliated with a luxury hotel, others were free standing locations that specialized in spa treatments, and others were still combined with a fit- ness or health and wellness center. Whether day spa or destination spa, one thing that all spas have in common is the need for branded goods. Bathrobes, towels, eye shades, slippers, and bags are just a few items a spa would be interested in. If the spa is affiliated with a hotel, they might use whatever linen supplier or decorator the ho- tel uses, but day spas are likely to not have a particular affiliation and may be more open to working with an independent decorator. In fact, unlike some other industries, the spa market doesn't tend to work with a product distributor. This is good news because it means the market is more open. The down- side to this, however, is it means you have to deal with each spa and teach individual decision makers. This means more work figuring out who to talk to, tailoring an in- dividualized pitch, and creating samples for each spa you approach. The upside to this is it might be easier to crack an individual spa than to get into a distributor's line-up of products. It also means that you control the buyer-seller relationship. DIPPING YOUR TOE If you are interested in entering the spa mar- ket, the first thing to do is figure out which spas you want to target. If you sell in a par- ticular geographic location, that's pretty easy, simply target the spas in your area. If you sell nationally or take orders online, you may want to target spas that do a particular type of business for which you think you can provide products. For instance, if you sell online and are looking to attract spa business, it is also a good idea to dedicate a portion of your website specifically to spas, highlighting clients you have in this market space and spotlighting products that, in your experience, have sold well in spas. Once you have your list of target spas, the next thing to do is figure out who the deci- sion maker is at your target venue. It isn't enough to drop off samples and a card at the front desk. Many spa owners get del- uged with product samples and are dealing not only with decisions about wearables, but also decisions about what hair, skin, and beauty treatments they carry. That's a lot of people wanting to get in the door, so you need to make sure that whatever informa- tion and samples you leave get in front of the right person. If you are near the spa or spas you want to target, a visit to the loca- tion and perhaps a treatment may give you a lot of helpful information. Spending some time at the spa may give you an idea of the type of branded garments they need or help you to tune into that spa's aesthetic. Vis- iting the spa can also help you get an idea of whether your design sensibility and way of doing business will mesh with the spa.